I’ll post pictures soon, but I’ve got to do some editing on the oodles of pictures that I took. Plus, many of the quilts came with touching or fun or interesting stories (or a combo of all three), so I want to spend some time looking at the show book for more quilt info. I want to be passing some stories along with the pictures and seeing if I can find some of the quilters on the interwebs to give them the mass kudos they should earn for their creations. I added some supplies to my stash because Joann Fabrics is having its 70 year celebration, and even though I have a wish list that’s going to need to be taken to my local quilt shop for fulfillment, Joann was having some crazy good sales that were too good to pass up. Those pictures are easier to post, so here we go. Well, I’m all in. I’ve got to make a go of my quilting Etsy shop because that behemoth roll leaning against the fireplace is 25 yards of cotton batting. 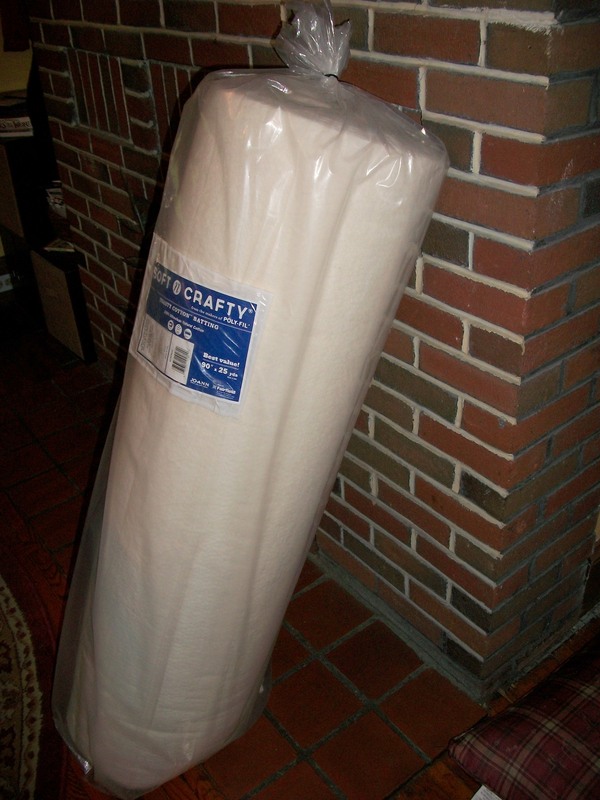 For less than $3.50 a yard, I figured it was a worthy investment, especially since it’s 90 inches wide, and most of my quilts finish at less than 45 inches, so I should be able to get two quilts per width of batting. Plus, as a bonus, it’s manufactured in the USA. Um…no big deal. I’ve just got to churn out 35 – 45 quilts to use this up, right? I’ve been wanting to play with flannel in a quilt, so today’s sale prices were too much for me to resist. Anything that hearkens to typewriter keys makes me a little weak in the knees, so I’m loving this print that I found. Gray, teal and lime is a color scheme that makes me drool a bit too. I’m going to have to hide this stuff to make sure I finish off my quilt along quilts before I cut into it. And, here’s a close up of the other fabric. I’ve heard that flannel has a nasty reputation for stretching and being a bit difficult, so I picked a simple pattern (at least, it looks simple). The pattern I chose calls for 13 fat eighths of fabric to go with the main fabric of the quilt, so I picked an array of blues and greens with a little sprinkling of gray. 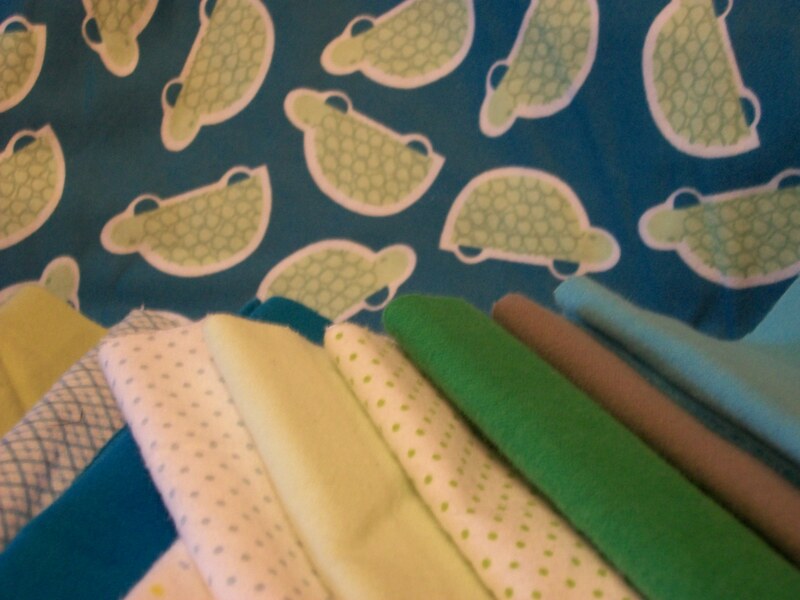 I made the decision to grab the turtle fabric when I realized that fat eighths meant that I was still going to have half of all those fabrics left. Probably if they were quilting cotton, I would have just filtered the leftovers into my stash, but since I don’t have flannel floating around, I figured I’d might as well enact a plan for using up all the flannel that I was buying. Those are probably quilter’s famous last words. This entry was posted in quilting and tagged quilt, Sunday stash. Bookmark the permalink. I have never tried flannel so am interested to see how you go. 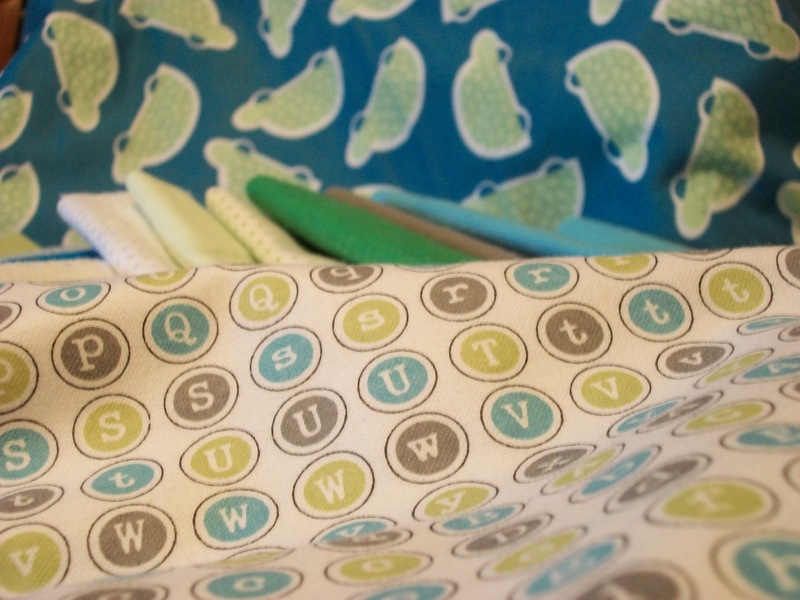 I know Kristy at http://www.quietplay.blogspot.com has made quite a few quilts recently with flannel on the back. I asked her and she said she doesn’t use batting with it. Oh my!! You’ve taken advantage of Joann’s deals like I have!! I came home with a big roll, just like yours, in the backseat of my car and my boyfriend was shockingly surprised at the jumbo roll of batting that I bought! more stretchy than cotton fabric, but not drastically.